Solarwave's solar collector consists of two layers of glass with a vacuum bag gap in between, which acts as a thermal barrier to prevent heat loss, which is a proven concept for use in hot bottles. Sunlight penetrates the transparent outer glass layer and is absorbed by the inner glass layer. The inner glass layer has three layers of coating material (ALN / AIN-SS / CU) with low emission and high absorption. Thus, the thermal energy utilized from the sunlight will be "locked" in the collector and then transferred to the hot water storage tank at an optimal level. Of course, at different times of the day, the sun's launch will change in the direction. This will then affect the absorption of solar energy by the system. 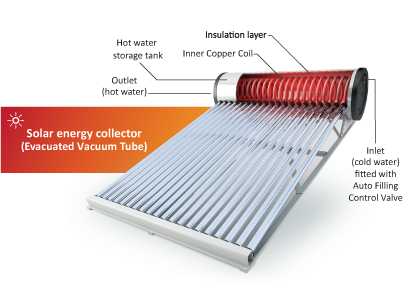 However, Solarwave's solar collectors are designed to be tubular, with greater sunlight throughout the day in the morning or evening sun. This increase in solar absorption will make the installation of our solar system less sensitive to the orientation and pitch angles on the roof area. In the first installation or when replenished by evaporation, cold water is injected into the hot water storage tank, which is automatically controlled by the diaphragm filling valve. Therefore, there is no pressure in the tank, which causes the system life to come directly from the direct cold water supply or the pressure of the pump system actually faces the inner copper coil inside the tank. The hot water stored in the tank is usually stagnant and acts as a "heating medium" for heating the internal copper coils. Therefore, our hot water storage tanks will work as “thermal energy storage” and will better preserve the heat energy utilized. The tank is made of 1.2mm thick SS304 food grade stainless steel, insulated with 60mm thick PU (polyurethane) foam, and the surface is made of stucco aluminum material, working pressure up to 600kPa (6 bar). Solarwave solar water heaters feature the most unique system design with built-in copper coils and built into the hot water storage tank. The hot water supply is not taken directly from the tank but through the internal copper coil. It is the most critical component that allows the system to produce hot water based on a heat exchange system that will enhance the insulation of the system. Cold water is sent to this coil and is immediately heated by the stagnant hot water stored around it by the natural phenomenon of heat. The exchange of cold water through this coil is up to 25 meters. Therefore, cold water does not mix or dilute directly with the hot water stored in the tank, which usually results in a significant drop in hot water temperature after overnight use and does not require periodic opening of the electrical backup booster heater. 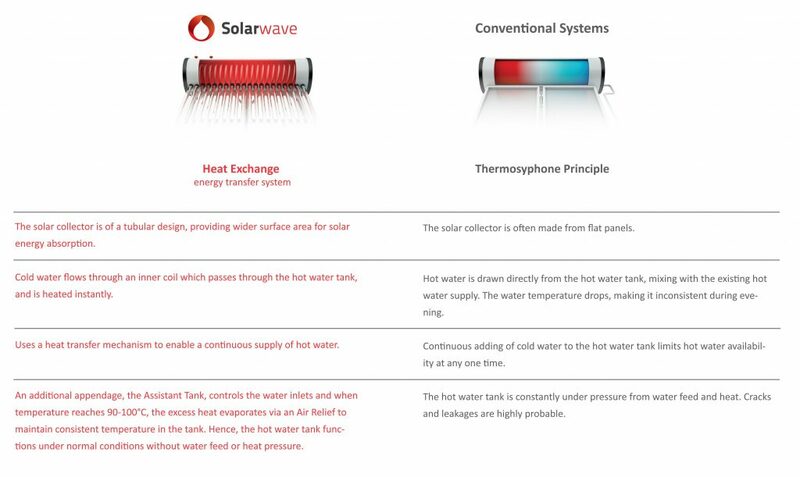 Solarwave's hot water supply passes through its internal copper coils and flows out immediately according to the user's needs, the same as the pipeline water supply. This method of supply is more hygienic because it is not extracted from the storage in the tank, which may be exposed to the risk of water contamination and sedimentation after prolonged use. 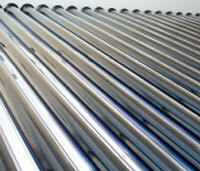 Solarwave solar water heaters work differently than traditional solar panel systems. According to the principle of heat exchange, when the heat energy is effectively preserved, the internal copper coil produced by it generates a higher amount of hot water than the capacity of the hot water tank. Therefore, the user no longer limits himself to a fixed amount of hot water supplied from the memory. - At the first installation, cold water will flow into the two inlets - one into the hot water storage tank and the other into the internal copper coil immersed in the water tank. - The incoming cold water is injected into the hot water storage tank through the diaphragm filling valve, and the filling is automatically controlled to prevent the pressure. 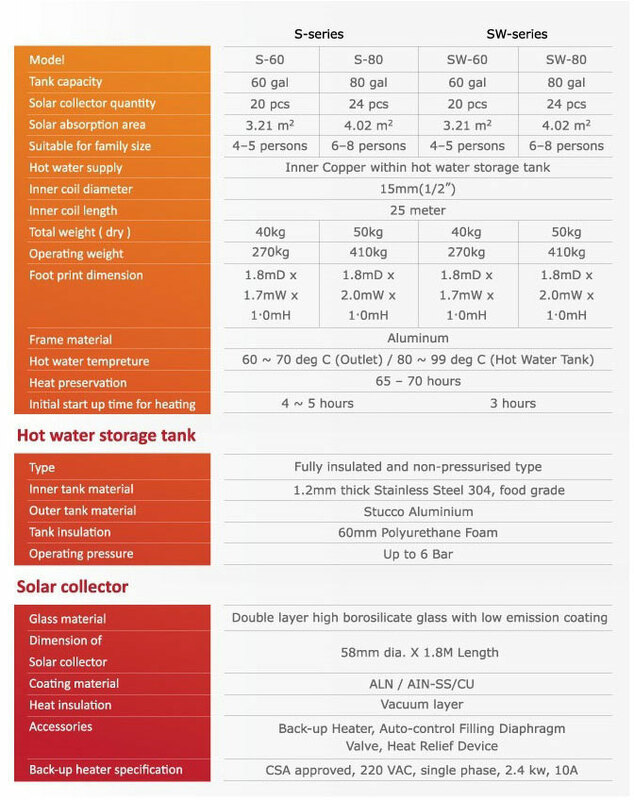 - The solar collector absorbs sunlight and transfers the heat to a hot water storage tank to heat the water stored therein. This stored hot water is stagnant and will heat the inner copper coil later when needed. - When the user needs hot water supply, cold water from the pump system or directly supplied will be sent to the internal copper coil and heated immediately by the hot water stored around it. The upcoming cold water will continue to flow into the internal copper coil, and the natural phenomenon of heat exchange is immediately converted into hot water, which is then supplied to the user. - Excessive heat generated in the hot water storage tank will be automatically released as steam through the air discharge port at the top of the hot water storage tank due to low usage rate or hot weather. The incoming water will then be replenished through the diaphragm filling valve and reinjected into the hot water tank.